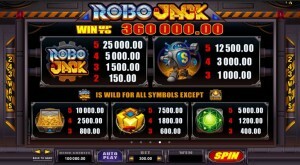 Robojack is themed around robots, using a futuristic design that mixes electricity, robots, chains and power sources. 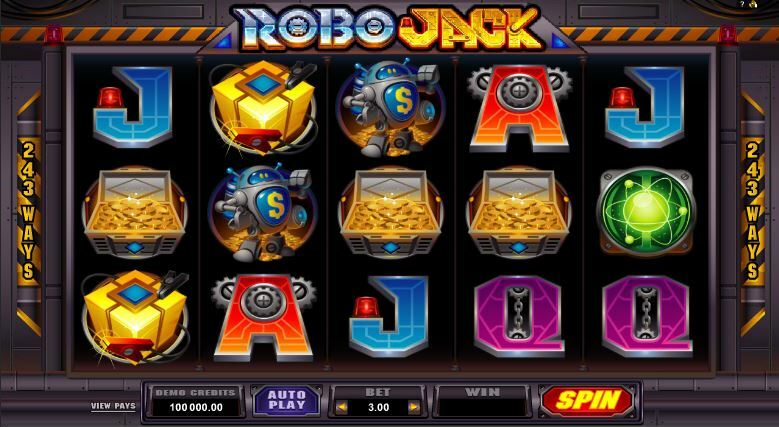 It is a Microgaming slot machine, which has ways to win instead of paylines, making it one of the more recent titles that they offer. Check out the features that the game has, they are especially fun when you trigger the free spins, but the ways to win are also big pluses in its favor. 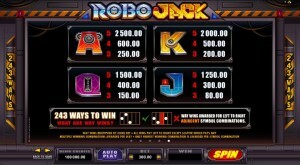 A modern Microgaming slot, it comes with 243 ways to win and 5 reels. 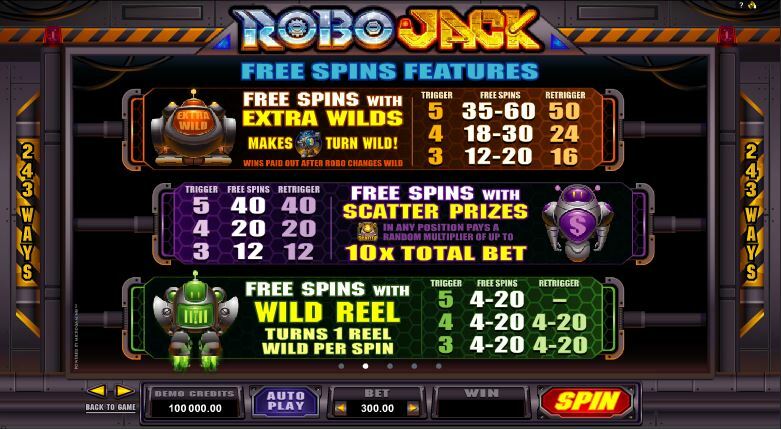 There are some impressive features to be had, like the free spins with different types of advantages that they can bring, the scatter symbols and the wilds. The top prize in the base game reaches $30,000. 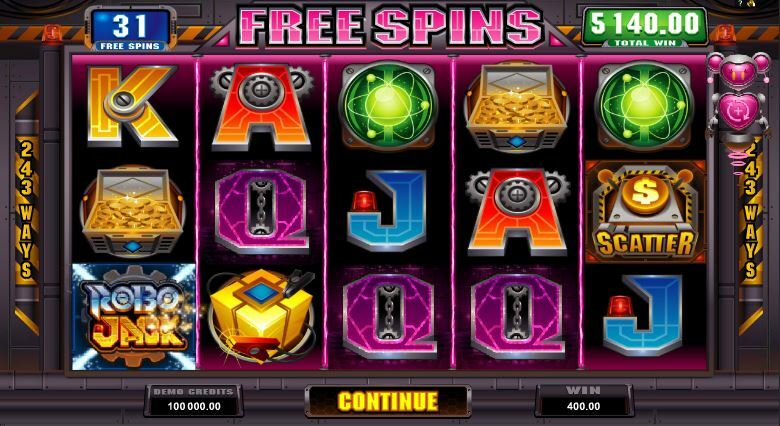 The game will give you access to ways to win, wild symbols, scatters and some very impressive free spins, with five different types of features attached. 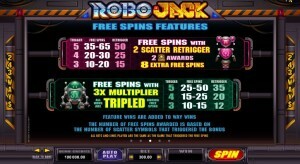 As I’ve said, Robojack has 243 ways to win that you can take advantage of. What this means is that the symbols need to be on consecutive reels, from left to right, but it doesn’t matter where exactly they’re located, as there are no regular paylines used. As for the symbols which are available, the wild symbol would be one of them, a very typical feature for a slot machine like this. 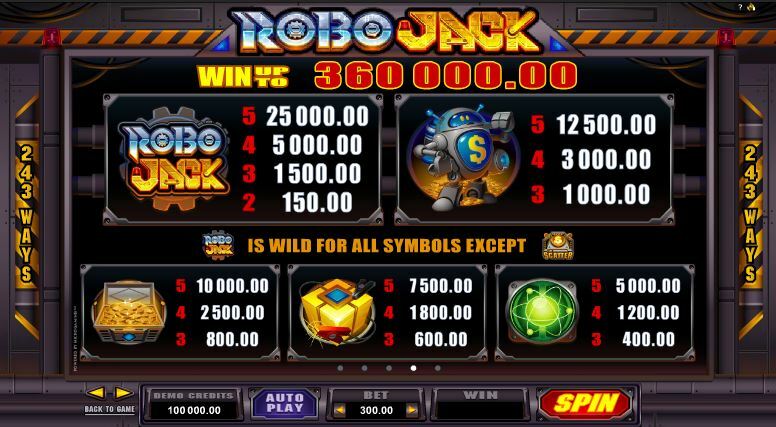 Using the Robojack Logo to represent it in the game, the wild is capable of substituting for all symbols, except the scatter. It’s also the kind of symbol that can give away prizes directly, while taking advantage of the ways to win system. You need wilds on consecutive reels, from the 1st going towards the 5th reel, and you will get a prize of up to 2,500x ($25,000). Second, we have a scatter symbol, which looks like a vault door that has a Dollar Sign on it. As it often happens, you can get two types of prizes from a scatter. A cash prize is awarded when up to five Vault Doors are present on the reels, whatever the position, and it goes up to 100x the bet. 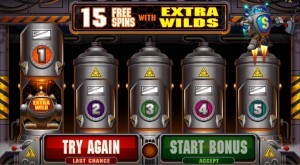 The slot’s free spins are also available when enough scatter symbols appear in the game, 3 or more being required. You get a bonus feature here, with five robots displayed on a screen. Each one brings a different kind of extra feature for the free spins. You get a random one, and if you’re not satisfied you can ask for a second chance. 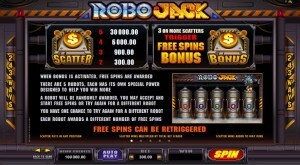 The Orange Robot will bring you 12 to 60 free spins, and if you retrigger the feature you get up to 50 extra. 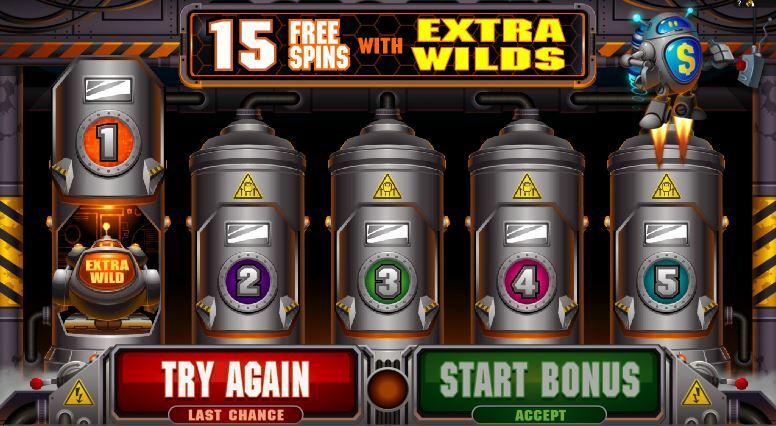 These free spins bring with them extra wilds. 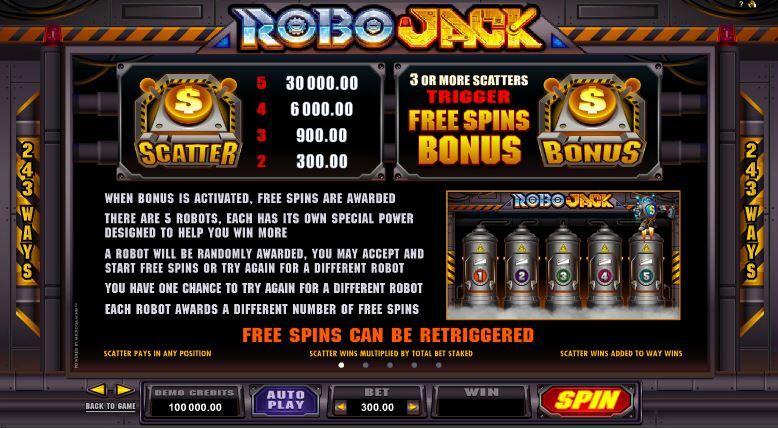 The Purple Robot will have 12 to 40 spins for free to give you, with the extra feature being a 10x the bet prize that comes from each scatter symbol that appears along the way. 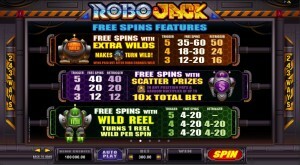 With the Green Robot, you get 4 to 20 spins that you don’t have to pay for. One randomly chosen wild reel is used during each spin. 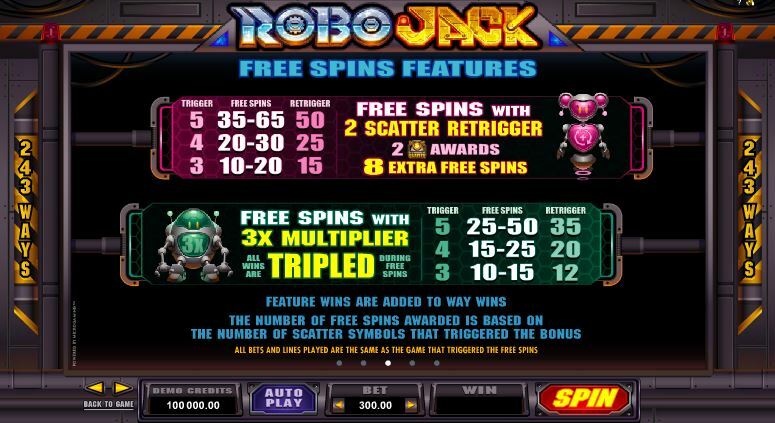 With the Pink Robot, you are offered between 10 and 65 free games, where if you have two scatters present you get an additional 8 free spins. Normally, you would need 3 or more to retrigger the feature. Finally, we have the Teal Robot, which has up to 50 free spins and 3x multipliers which affect all the wins you get as you play. 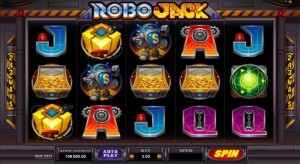 The betting system has three components in Robojack. You have the number of lines first, which are 30 in this case, since the game doesn’t ask you to cover 243 ways to win. Each line has 1 to 10 coins used on it, while denominations are between $0.01 and $1. You have line bets of up to $10, with the maximum bet at $300. The game will tell you exactly how much you can win, the paytable values modified each time you change the wager value. The scatter symbol can bring you $30,000 cash, while the wild has up to $25,000. 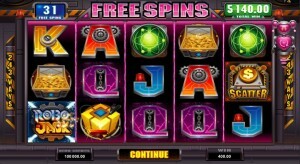 The features of the free spins can improve those prizes significantly. The design is industrial, with a strong futuristic look to it. There is metal all around the game area, with warning tape style borders and red alert lights in the corners. The symbols have either robots in them, or there are chains, screws and light bulbs added. The treasure chest is there as well, an element that doesn’t seem to miss from most games these days. Overall, it’s a good looking game, though as usual I would’ve preferred to be fewer cards and more themed symbols. Symbols: Vault Door (scatter, 100x the bet), Robojack Logo (2,500x, wild), Robo Jack (1,250x), Treasure Chest (1,000x), Energy Source (750x), Nuclear Logo (500x), Ace (250x), King (200x), Queen (150x) and Jack (125x). I’ve enjoyed the theme and the way the design was implemented, but even if you’re not a fan of science fiction you’re probably going to have fun. The free spins will do a lot for your enjoyment level, offering a lot of rounds for free and with some very cool features alongside them. 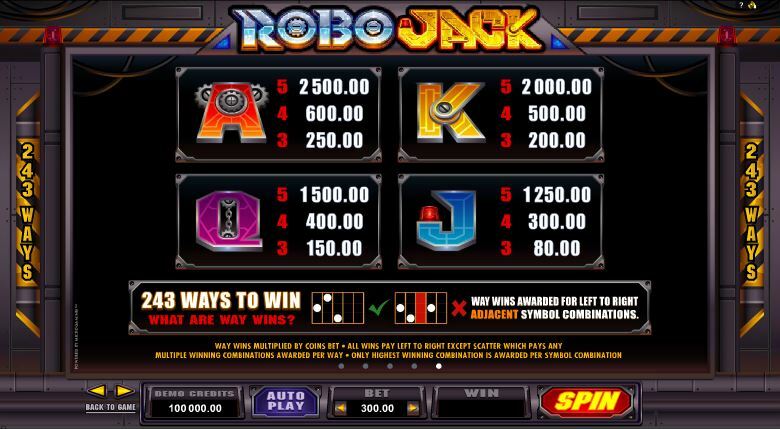 Robojack can be found at any Microgaming casino, where you get a chance to play it for real money or in free mode.